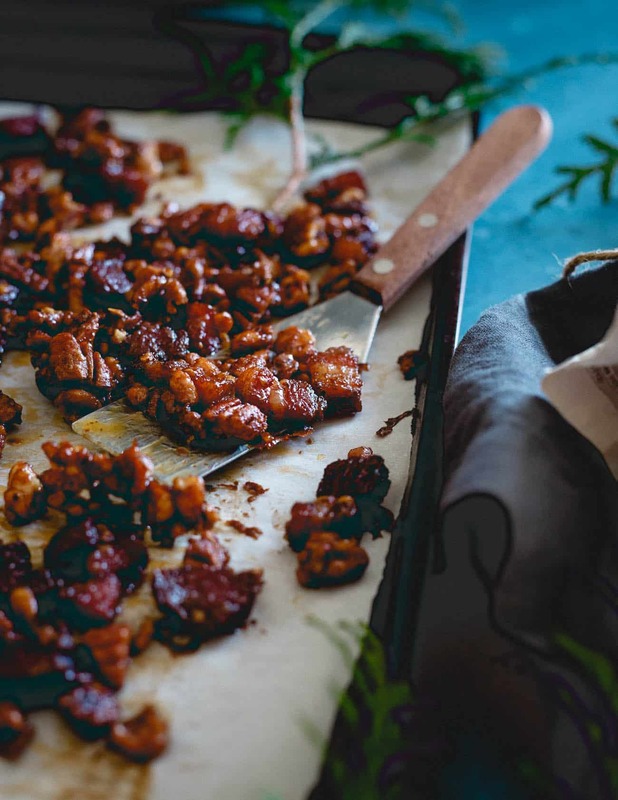 This candied bacon nut brittle is spicy, sweet and outrageously delicious. It also makes the perfect DIY food gift for the holiday season! Put the name brittle in something and usually I can assure you it will dissuade me from wanting it. It’s weird, for as much of a sweet tooth I have when it comes to cake, pies and all things chocolate, candy does pretty much nothing for me. I’d turn my head at just about anything from Twizzlers to Blow Pops to Jolly Ranchers to Werthers, even a homemade peanut brittle if it was my only dessert option. 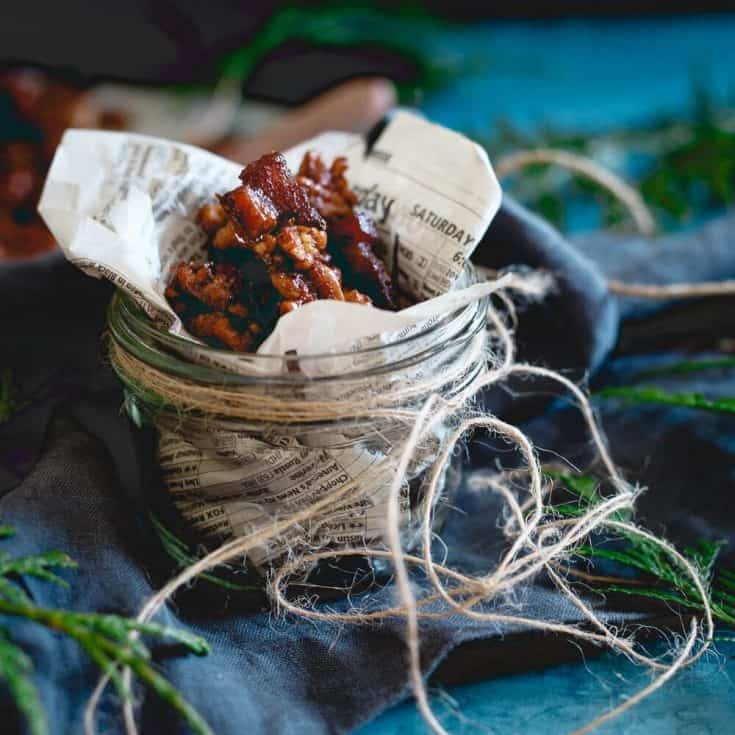 That was, until I candied bacon, baked it together with some candied nuts creating a brittle-like snack that would be absolutely perfect as a DIY holiday gift and realized I now have to change my stance on all things “candied”. 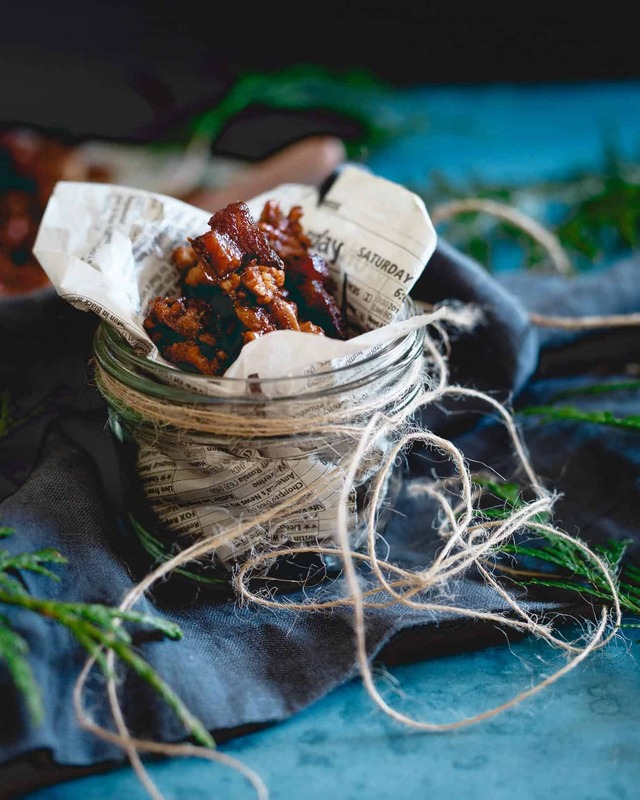 I hate the association of food to crack, it’s overplayed and quite honestly, stupid but, BUT!, if ever there was something to be likened to an addicting illegal substance, it’s this candied bacon nut brittle. Sweet, salty, savory, spicy and crunchy. It’s like granola and brittle combine with a lovely bacon fat blanket wrapped around them both and I can guarantee you that whether you’re eating it straight, crumbled on top of some yogurt, oatmeal, salad OR (just thought of this one!) on top of some vanilla ice cream (ehhrmagod) you’ll probably end up eating the whole batch, licking your fingers and then looking around to see if anyone else just witnessed that gluttonous annihilation. I don’t really “do” crafty gifts, art class was never my forte. The most crafty I get is some string and a mason jar. Exhibit A above. 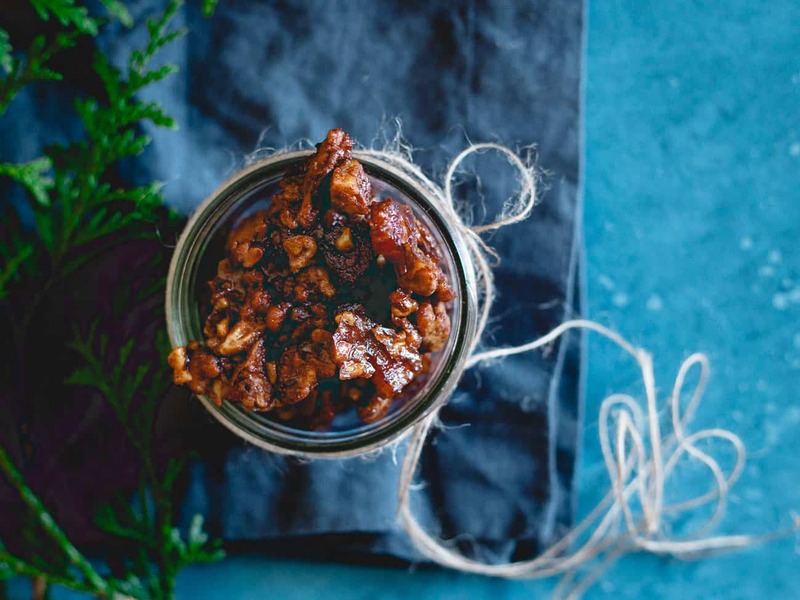 If you get this candied bacon nut brittle from me this year for the holidays though, I don’t think you’ll mind the humble vessel it comes in. Prepare the bacon by combining all the ingredients in a small bowl and tossing until bacon is fully coated. 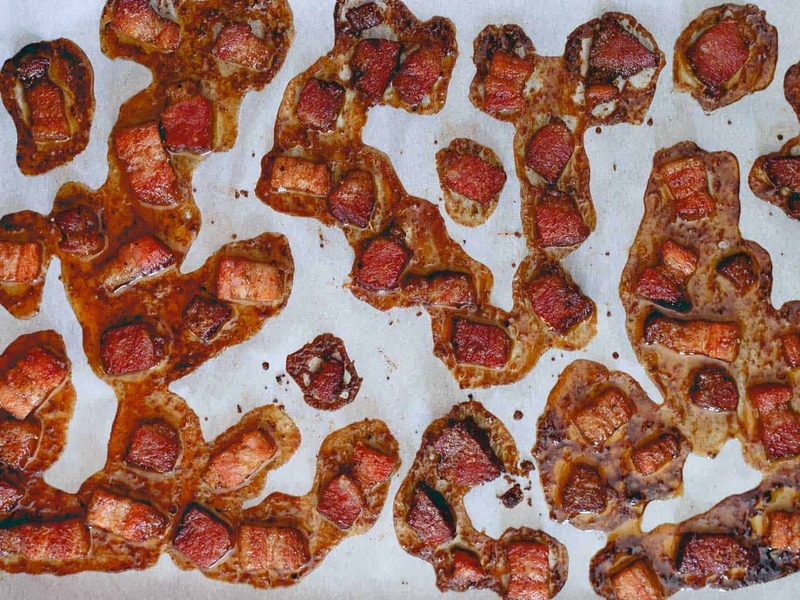 Spread the bacon out onto the parchment lined baking sheet in a single layer. Bake for 10 minutes until bubbly. Meanwhile, combine all the ingredients for the nuts in the same bowl as the bacon, toss until well coated. Remove bacon from the baking sheet using a slotted spoon to reduce the amount of grease/fat that gets picked up and place in the bowl with the nuts. Change out parchment paper on the baking sheet, toss the nuts and bacon together until combined then spread out evenly in a single layer on the baking sheet. Bake for 15 minutes, tossing once halfway through. Turn off oven, open the door a crack and let sit in the oven for another 15 minutes. Remove from oven and let sit until hardened and cooled. Break into pieces, place in a sealed jar for gifts or storage. This is too good to be true! It’s time to change the dish I’m bringing to Thanksgiving because this is a winner for sure. Candy doesn’t do anything for me either, but anything savory that’s been candied… count me in! This brittle sounds amazing!! 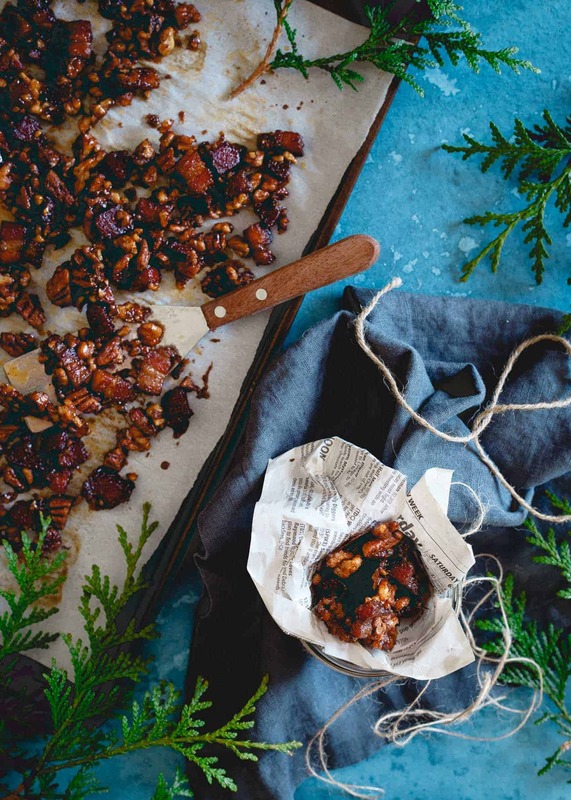 Ummm candied bacon nut brittle?! This is freaking awesome. This looks amazing and addicting! love! This is outrageously awesome in every way! Wow, wow, wow Gina! I LOVE brittle, so I KNOW I’m going to love this! Seriously?? Bacon?? OMG, love, love, love! OH!! Love this holiday snack! Sounds delicious! Ermageerrrrd!! I NEED this in my life!! What more could you want?? Gina, my mouth started watering when I saw this, seriously! I have a friendsgiving gathering the Saturday after Thanksgiving (I know, more gluttony after the holiday of gluttony). I’m definitely making these for the party! My friends will love it. I’m a savory girl. So hand me some of this cause bacon is my jam. Candied is AWESOME. Can i be the receiving in please? If I were to use precooked bacon (I know, I know) how would I need to adjust the baking times? I’m honestly not sure how you’d candy bacon that’s already cooked. I feel like it’d end up burnt in the candy-ing process? You could play with it in the oven for maybe half the time but I’m just guessing at that. Could you substitute raw sugar for the coconut sugar – I have no access to coconut sugar. Yep, coarse raw sugar or brown sugar would work fine as substitutes. Can you please tell me what ingredients go with what? With bacon at the top and syrup at the bottom I am not sure of the mixture! Hi Kathleen – the recipe has been updated to be more clear. I switched recipe card technology recently and some of the formatting didn’t carry over. Sorry about that! Made tonight and while very tasty this wasn’t clumps like photo shows, rather loose bacon and nut pieces with the coating. Don’t be shy on the cayenne. Wish I had used even more. Would “thick sliced” bacon work?